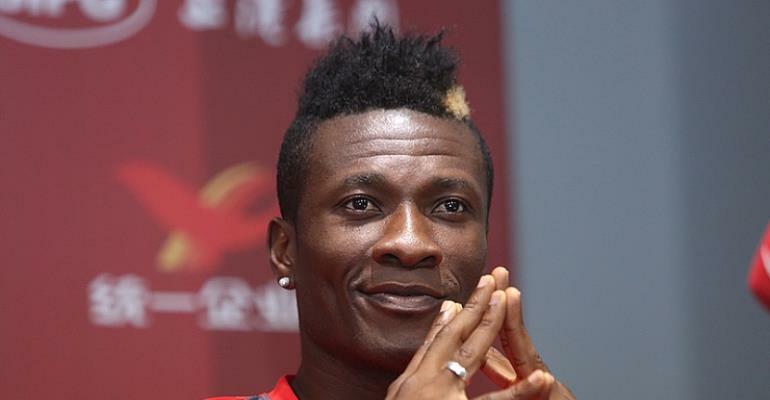 Black Stars Captain, Asamoah Gyan, has presented items worth thousands of Cedis to the Dzorwulu Special School in Accra. The items included cartons of assorted Planet soft drinks and boxes of Verna natural mineral water. Gyan, who was in the country for the international friendly break said he was moved by the pupils' condition to reach out to them. The Kayserispor attacker noted for his regular philanthropic activities mentioned that "We are here today to share what l have with my special friends. In fact, it has always been on my mind to visit and have fun with you guys, we wanted to be here last Christmas but busy schedule robbed us the opportunity. "l am happy to be with you and l promise to visit from time to time, l wish you well in your studies. Study hard and l promise you the sky will be the beginning of your exploits." An official of the school, Frederick Tetteh on behalf of the kids thanked Gyan wholeheartedly for the gesture saying "we are indeed grateful for the gesture and your visit, you have no idea what your visit has done in the lives of these precious children, God bless your career, thank you."